I own that one. The price might look good but S&H is VERY pricey to the US. I had never tried a true adult onesie/romper till recently, and they are perfect. It's a tshirt yet it's also underwear and it's keeping everything snug and tight while wearing a cloth diaper and plastic pants. I was going to wear them as just an "undershirt" type deal, but they seem to just look great as they are. My only "downside" is unsnapping & resnapping when I choose not to use the diaper. Any suggestions on how else to wear them? Anything they pair great with? I am also looking for the best brand or type to wear as well as any other type of material outside of cotton, such as a PVC material like my plastic pants. Lately, I find myself loving wearing cloth diapers not for the diapers, but for the plastic pants over them. I just cannot get enough of how they look and feel. This is why I had asked about wearing just a cloth liner/soaker with them, as I've really begun to love how the plastic pants look and feel, as I rarely use the diaper. On 6/24/2017 at 11:15 AM, dlnoir said: Yes I do wear plastic pants with just cloth diaper inserts every so now and then but just around the house. My experience? Well in all honesty they do not hold a lot but for me it is more about a nostalgic feeling. I do use them to wet, just one wetting should be fine if you are not exploding. I am born and raised in the time that cloth was still the thing to use and that feeling stayed. I do have a picture of the pant with pockets, hope you like it. I don't wear disposables, never really have. I simply wore the cloth pull up w/ no extra inserts, plastic pants and a onesie. It can easily take 2 wettings, and thats good soakings. Tops ive done is 4, and it leaked into the PP by the 4th. We only have 1 bathroom for about 120 people, and 90% of the people know me. I usually wear cargo khaki type pants, maybe jeans on the weekend. Wearing them was the easy part, but I would probably want to change at somepoint during the shift. Odd as usually if I have to poop, I also have to pee. I got to imagine others who wear this are faced with this issue. I was thinking of how it would be as a regular diaper, not just for swimming, but I'd use it for that too. How well does it hold urine? On a whim, I decided to wear my cloth diaper to work today. I found some pants that fit over them nicely, and brought a backup set incase of issues. I wore them for 10 hrs, and wet them 2 times. No noticeable drooping or bulge (I did wear plastic pants and a onesie) and it felt fine. When I got home, the diaper was VERY wet, as was my mid section where the wetness was. However, it created a few questions: It seemed like wetting 2 times might of been pushing it. I felt like there was slight urine smell (I could of been imagining things) but I didn't enjoy how wet I was by the time I got home. So how do I handle changing? What do I do with the wet cloth diaper afterwards? What is the best way to go about bringing supplies in/out of the bathroom? I've asked this question many years ago and got mixed results and wanted to see if this has been tried/tested more. 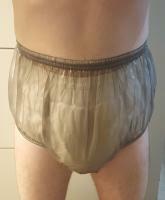 Anyone ever wear plastic pants with just cloth diaper inserts? If so, what was your experience like? Did you use them to wet? 18 hours ago, deewet said: Even while driving, if I have a diaper on and have to go, it just happens. Best "everyday" clothes to wear with diapers? 16 hours ago, MarkSmith said: To me it is all about what you wear underneath. I was also thinking those jumpsuits, like a mechanic or technician might wear. Though that can look quite out of place, but seems really comfy and easy to wear. I recently decided to wear denim overalls with a diaper, and it felt comfortable. I liked that I didnt have something I needed to use a belt for or tie, it just slid right over the diaper. 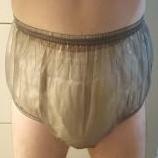 It got me thinking, what else can be worn for "everyday" use, out and about, with diapers that is super easy and comfortable for men? Women have it a bit easier with skirts and dresses, but most mens clothing can be a bit restrictive in the crotch area, esp. with diapers. I do find nylon/track pants to work well, but haven't found much else that I can wear where I feel truly comfortable in with a diaper underneath. Suggestions?